It’s finally spring! Something about the warmer weather and more sunshine puts us in the mood to get things cleaned up and back on track after a winter slump. 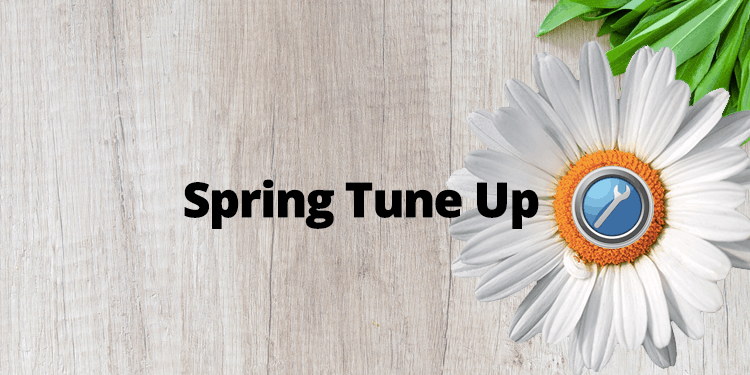 It’s a good time to do a spring tune up for your business as well. Below is a quick list of items you might want “tune up” so that you are more efficient and get the success you desire. Unneeded Subscriptions – Check out your most recent expenses either via a bank statement or credit card statement. Do you have recurring subscriptions you are not using? It’s April are you using that gym membership you signed up for? Do you have training memberships you aren’t using. Check out each of the monthly items and ask yourself is it something I’m going to use? If so schedule some time and make sure you use it. More Than You Need – While you are looking at your statements are there items that you do need that maybe you are paying too much for? Sometimes when you have a utility or a service you use you may be persuaded to by the a higher level at a “discount” for the first six-months. After six-months the price goes up and maybe more than you actually need. It takes just a few moments to check and see if there is a better rate. I’ve found that some places such as your cable bill, internet bill or phone service you can call and ask for a review or check to see if they are running any current specials that will reduce your bill. Car Maintenance – Even if you work from home you do use your car for appointments or running to meetings amongst other things. Just by having your car serviced to have filters changed, fluid checked and even air pressure checked will make your car run much smoother and more efficient saving you money by making your tires last longer and save gas too. Website Maintenance – There are certain things you do on a monthly basis such as update your WordPress theme and plugins. But there is other items you should do once a year. What I normally do is visit my website, go through each menu item and follow each link. Does it work as it should. Does the text read correctly and is it current? Do you have any opt-in forms? (if you don’t ask me, I’ll explain why you should.) Opt-in to each of your forms. Did you receive the confirmation or the first message. Did the links in the email work? If the email references a download, did the download work? Is it still current? Computer Maintenance – If you are like me you spend a lot of time on your computer. You’ve probably saved a lot of documents downloaded a lot of files and images. It’s a good idea to review and clean up your download folder are there files you can delete and clean up some space? I like to store my files off of my computer either on a network storage device or a cloud service. So at least once a year I will check my local computer in the downloads folder, documents folder, pictures folder and video folder, to see if there are files to delete, move, or copy to my storage destination. That will help free up space to save a catastrophe from helping down the road. There are some other steps on computer clean up that could be discussed but they’re a bit more technical and I’ll save those for another post for simplicity purposes. Do you have a tip to share? I’d love to hear it. Leave it in the comments below and I’ll check them out.